As for the personal criticism, the top US diplomat said, “they’re wrong about that.” Deputy Foreign Minister Choe Son Hui had taken pains to tell reporters that President Donald Trump was not the problem, stressing that ties between him and leader Kim Jong Un were “still good and the chemistry is mysteriously wonderful,” according to the New York times. Pompeo appeared to dismiss the rhetoric as a bargaining ploy or an attempt to drive a wedge between the US team and described his interactions as professional. Choe blamed the breakdown of talks on the US side, saying the American delegation was being too demanding and inflexible: [The US] “were too busy with pursuing their own political interests and had no sincere intention to achieve a result,” Choe added, according to Russian state news agency TASS. Choe said the North was deeply disappointed by the failure of the two sides to reach any agreements, according to TASS. The summit ended abruptly without a joint agreement after Kim insisted that all US sanctions on his country be lifted. Trump, who has said the US has ended the nuclear threat from North Korea, said Kim had offered to take some steps to dismantle his nuclear arsenal, but hadn’t gone far enough. “Sometimes you have to walk, this was just one of those times,” Trump said of his early departure from the summit, insisting he was in no rush to strike a deal. 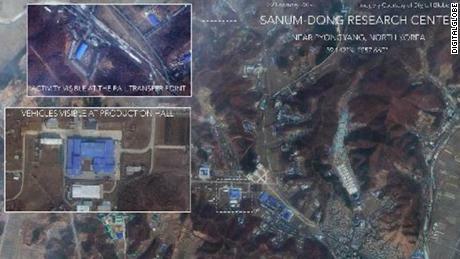 Satellite imagery has revealed activity at a North Korea rocket site, though US officials say there’s no signs yet that Pyongyang is preparing to restart testing. The price for the lifting of US and United Nation’s sanctions, Pompeo said, is denuclearization. He referred more than once to Kim’s verbal pledge to denuclearize, which has not been formalized. “That’s the requirement laid out by the United Nations Security Council,” he said. On Monday, the US special representative for North Korea said Washington would not accept a phased denuclearization by Pyongyang and maintained that the two nations remain closely engaged despite the collapse of the Hanoi summit. Bolton also disputed Choe’s characterization that he and Pompeo had created a “hostile atmosphere” as “inaccurate,” and said he had discussed the reports from North Korea with his South Korean counterparts this morning.